Monthly box subscriptions are all the rage lately. 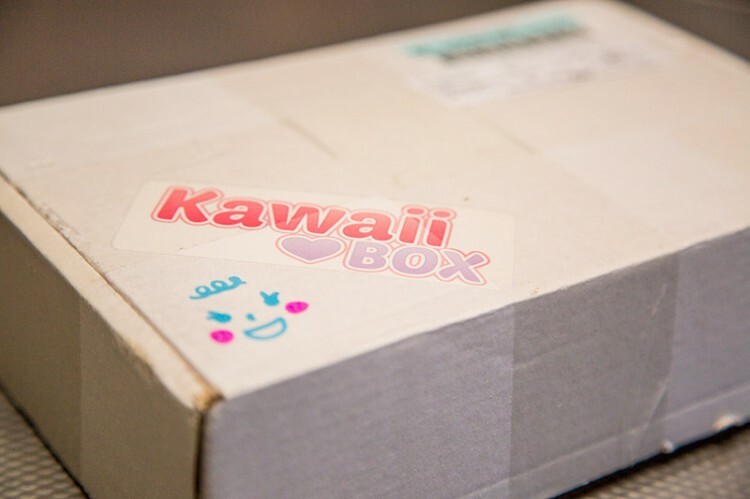 When the people behind Kawaii Box contacted us about reviewing their monthly box of cuteness we were pretty excited to see what they had to offer. As a quick introduction, Kawaii Box is brought to you by Blippo, an online site where you can buy mainly Japanese and Korean goods like magazines, plushes, accessories, stationery, purses, etc., all of which fit within the category of "cute." Every month they select 10-12 items, pack them up, and ship them to your door. They ship globally and payment is through Paypal. How convenient! Some of the items in the box were really nice quality and totally cute. The Watermelon purse is absolutely adorable and would be great to store change, on the go makeup, skinny mini watermelon slices, and really any small items you don't want bouncing around in your purse. It is also really soft. The Rilakkuma Aloha note papers double as sticky notes, making them useful and cute. 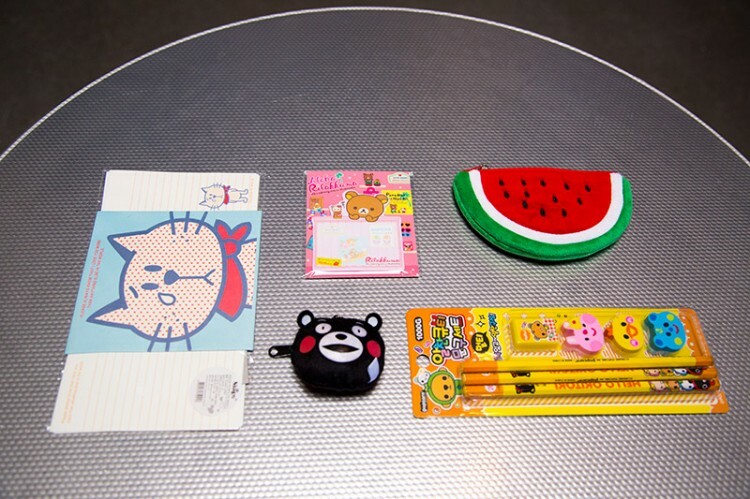 The Korean stationery set we got is just melancholy enough to be charming, and you'll always win our hearts with Kumamon, small as this plush was. 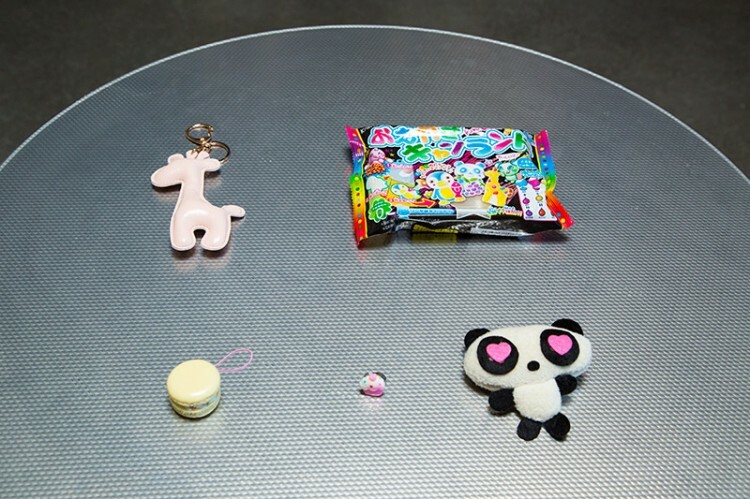 The Korean Stationery Set included pencils, animal erasers, and a sharpener, once again mixing cuteness with something you can use. Some of the items didn't hit the mark. The cupcake ring was bent and the colors had blended together so it looked stained. It's also child sized, though you can bend it to make it bigger (it still didn't fit my 5-½ to 6 size fingers). The Panda plush looked like something I could have made at summer camp with a hot glue gun, in fact you can still see the glue and some of it's stringiness was coating the panda when we pulled it out of the box. The giraffe keychain simply didn't seem to fit with the theme of the box and I can't really see it's charm, but maybe someone who loves giraffes would like it. It's just so bland to me. The candy set is cute, but if you plan on using it, they don't taste very good. It's the kind of candy that's marketed to kids where the fun comes from the process of making them, rather than eating them. 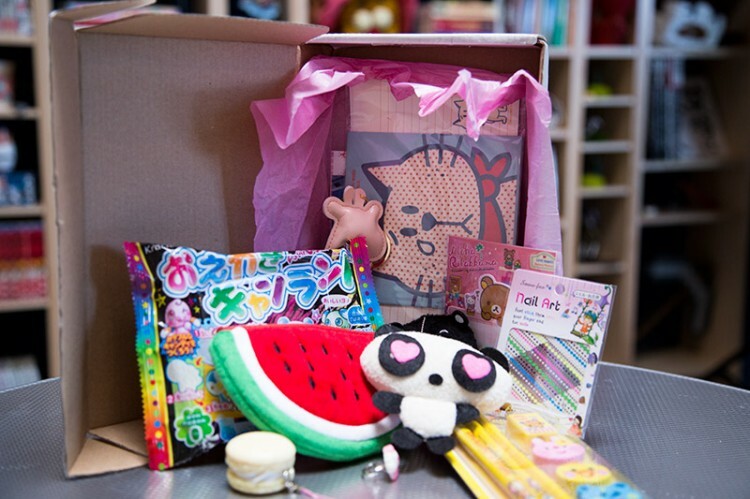 Kawaii Box is $18.90 a month and if you really want to bolster your collection of cute stuff without having to pick and choose things on your own, you'll probably like this subscription. 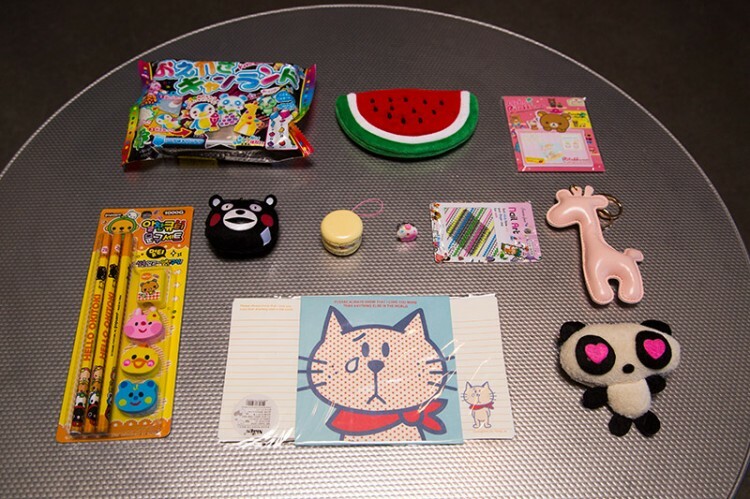 After some searching, only two of the items in the box are actually up for sale on the Blippo site, so simply checking out the items on the Kawaii Box site and then trying to order the ones you like yourself probably won't work. However, one of possible reasons these items can't be purchased is because they're small items that would normally come with bigger, better ones. You know how when you order a large plush, sometimes it comes with a smaller keychain or a bonus item? That's what most of this stuff felt like, and it was pretty disappointing. If you add up the retail cost of everything in the box it would exceed the cost of the box itself, so you are getting some value there. I personally wouldn't pay $18.99 for all these items, but that's just my own opinion on what's cute and worth buying. You can see the items above, and you can see past items on their website. Use your own definition of "kawaii" and decide if it's worth it for yourself. Some people might find the lesser appealing goods in the box to be charming, and if so, please go ahead and subscribe. Maybe with time and more subscribers Kawaii Box will be able to increase their box's value. 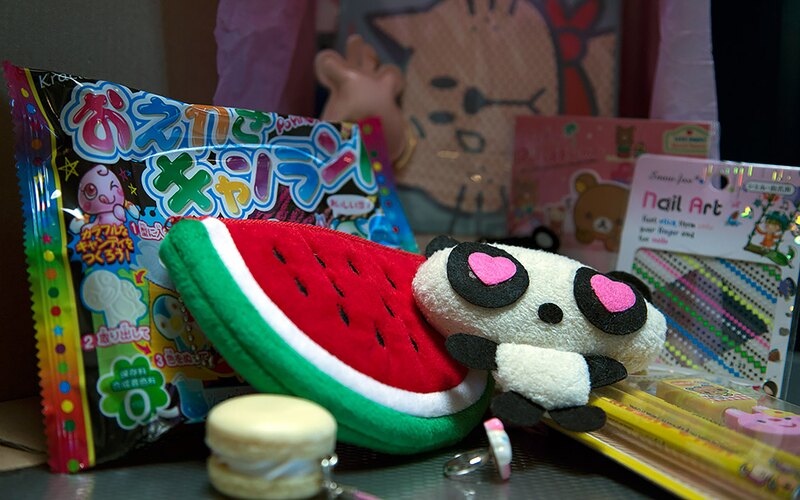 Until then, we give the Kawaii Box 6/10 fuzzy watermelon pouches. Maybe I’m just a curmudgeon, but this box just didn’t live up to my expectations. If I’m signing up for a subscription I want at least 80% of the things in there to be usable/worth my time. Cheap, uninteresting, and not particularly cute. I guess if you like having “stuff” (get ready for it to break), then you might enjoy this. Besides the quality of the items, I just can’t get behind the philosophy of getting things you don’t need in your mailbox every month. Back when we got this box, it was all right. It seemed a little sad, which actually added to its cuteness, in my mind. But now, the business seems to have grown, so check it out and judge for yourself. I think if you just like cute stuff in general, then this might float your boat… for a few months. But if you’re looking for your favorite characters, just go on Amazon and choose your own cuteness. A good value. Cost of individual items exceeds price of the box. There's a few cute things in there. There are too many low-quality items. The word "kawaii" is subjective.